A two year old. A finished sweater. A few days ago, we celebrated my little boy’s second birthday. Unbelievable. 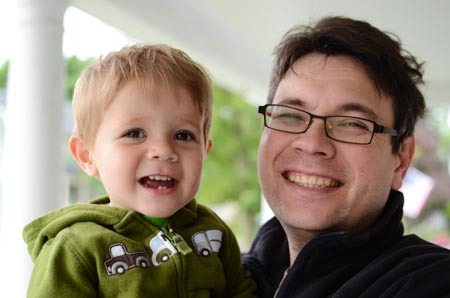 Here he is, on his birthday, with the Mister. Pattern: my own Budgie, 3-6 months size. Yarn: Blue Jellyfish handspun from Pigeonroof Studios (80/10/10 superwash merino/cashmere/nylon, 170 yards of DK/worsted weight) plus Berroco Vintage #5101 (mochi) (left over from knitting the Preppy Cardigan). 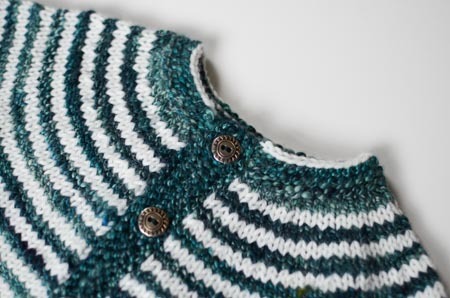 The handspun is beautifully variegated, with hints of blue, green, and gray. Needles and finished measurements: US 6 and US 7 circs; 20″ chest circumference, 6″ sleeve length to underarm, 10.25″ shoulder to hem. The sleeves look a bit long to me, hmmm… Fortunately, they can be rolled up ;). 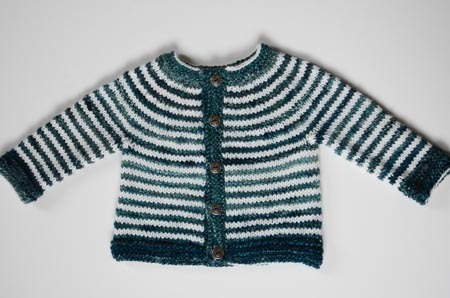 The buttons are simple, but appropriate (I think) to the nautical tone of the sweater. 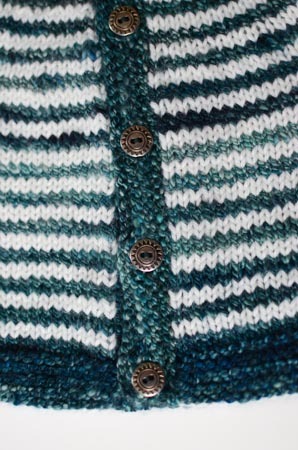 Also, I think they might be the exact same buttons I used on this (nautical) sweater, though purchased 3.5 years apart. Now that this sweater is off the needles, I’m focusing on some socks for my grandma! I last talked about the need to knit a pair of sock for her here. I did end up using the Traveler’s Stockings pattern, and Lorna’s Laces Shepherd Sock in turquoise (22ns). I’m nearly done, stay tuned for pics! Wow – 2 years old already! Happy birthday to your little man. Aww, happy birthday! That’s a great Father’s Day photo, too. Happy birthday to your little one! Mine turns two tomorrow! It’s hard to believe it has been two years. A great photo of two cuties! Happy birthday, Gregory! He is ever more adorable! Is it my imagination or is he starting to look like his dad? It may be time to get a new spam filter. . .